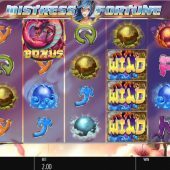 Mistress of Fortune slot joins an ever-growing collection of slots with Oriental themes. This time though, an unusual format for Blueprint Gaming, there are 4 reels and 5 rows as the framework for the pretty typical symbology of which includes the card symbols formed of Chinese brush strokes and various coloured globes. You can get more than one symbol on the reels due to the stacking of them which adds to the potential pays considering there are 40 pay lines to land them on. The music you will no doubt be familiar with; the Eastern soothing pipes and dramatic cymbals when the reels land with wins or specials like the scatters and Wilds. The best paying icons are the globes which award 10x stake for 5-of-a-kind of the Reds, down to 2.5x stake for the lowest card symbol. You do however have the blessing of full stacked Dragon's Lair Wilds on all 5 reels which could theoretically fill the whole screen for 40 lines at 12.5x stake or in other words 500 times your bet. There are Maroon Dragons rampant on the middle 3 reels which when landing will trigger the game's bonus round. If you land the 3 Dragons in the centre you will be presented with a different reel set that has all the symbols stacked 4 rows high unlike the base game. You still have the stacked Wilds and now there are additional stacks of cartoon images of Oriental-attired young girls, very much resembling the lead symbol from Netent's Koi Princess slot! These are mystery symbols and will transform to another icon randomly when they appear. You initially get 5 spins but they can and frequently do retrigger. These mystery stacks also appear very often and this actually makes the feature quite rewarding most times you trigger it.